I usually keep them at par with our own duo MSV-TKR. One common similarity between both duos is that they give utmost importance to the main melody and choosing lyrics that fit/ do not disrupt the melody flow. Also both were the pioneers of light music in their own ways. In fact both duos have similar influences in a few of their compositions and in the compositions of other composers For eg : kisi ki muskarahaton from anari (1959) has a similar song in Annai (1962) in buththiyulla manidhan . The latter's ninaipathellam from nenjil oar aalayam gave influence for the equally sombre classic yaad na jaaye in its Hindi remake dil ek mandir. The song pyar hua ikrar hua was 'used' in tamizh songs by the deva family - once in a decent way [Sembaruthi poove - kaadhal solla vandhen-deva (unreleased film in the late 90s)] and another in a horrible way (Innum enna vanam - ayudham seivom - srikanth deva). 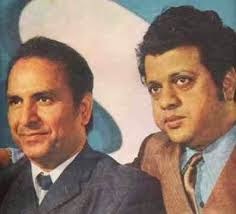 The song 'Jeena Yahan' from Mera Naam Joker was the inspiration for the first two lines of the famous song 'Kaadhodudhan Naan paaduven' Much of their best compositions were from their collobaration with the show man Raj Kapoor. With amazing musicians both duos gave songs that are immortal, grand and most heard. Quite a lot of these songs are from the limited collection that I have / remember. There are numerous other songs that have impacted my musical senses.